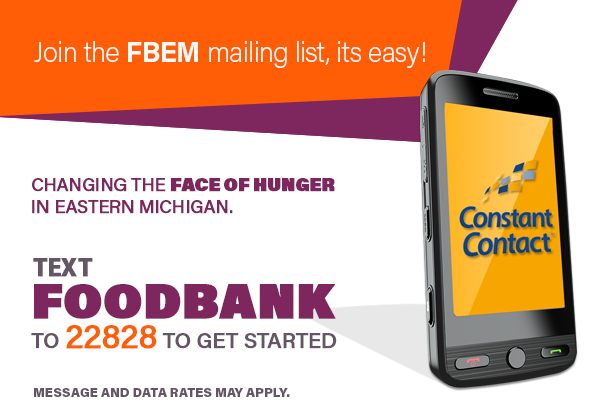 The Food Bank of Eastern Michigan and its Partner Agencies are providing food to neighborhoods by the truckload. 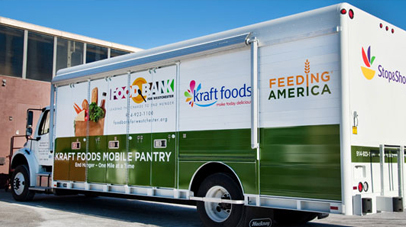 Featuring an average of 13,000 – 15,000 pounds of supplemental food, the Mobile Food Pantry allows agencies the ability to target areas of great need- even though they may not be physically located in that area. Only current partner agencies may host a mobile pantry distribution. For information on becoming a partner agency, please contact Agency Relations at (810) 239-4441. Find a location for distribution. This may be the parking lot of your agency, a school, or other easily accessible location within the community. Make sure you have permission first! Schedule a day and time for delivery with the Food Bank. Announce the time of distribution to your clients and others in the neighborhood who are in need. On the day of distribution, have volunteers on-site to help distribute food and record who received it. After the food is distributed, dispose of all trash and return pallets and unused boxes to trailer bays. Product is delivered either in a straight truck or a semi trailer to the agency’s site of choice, depending on the size and scope of services to be provided that day. With a straight truck, between 8 and 12 pallets of product will be delivered, while a semi would deliver between 16 and 22 pallets of supplemental food. Food would be off-loaded at the site for agency distribution. Here is a schedule of our Mobile Food Pantry locations. Please use the monthly, weekly and daily view buttons to better assist you in finding a location. Click on any item to see more details.